'Even paranoids have enemies' is the reply Golda Meir is said to have made to Henry Kissinger who, during the 1973 Sinai talks, accused her of being paranoid for hesitating to grant further concessions to the Arabs. It is used as part of the title of this book to highlight the complex relationship between paranoia and persecution. The politics of the Middle East, the pressures within Japanese society, the dynamics of the drug scene, racism, and the effects of mechanical thinking in institutions and cultures all serve to illustrate in this book the intimate connections between paranoia and persecution. 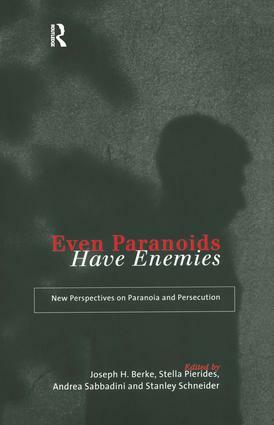 Contributors examine the ways in which paranoia and persecution are experienced at the individual, institutional and macrosocial level. They draw on theoretical perspectives from a range of disciplines in an exploration of both the psychological impact of paranoid processes and the extent to which these processes are rooted in political and cultural exigency.